Just an attempt to improve my use of WordPress. Hope these are of interest whilst I begin work on my next substantive post, called “ARRIVING”, at present. As always, my thanks to descendants of the orphans who sent me photographs to use. I’m having a little trouble aligning these pics. Once I enter a caption they take on a life of their own. I’ll try adding some more a little later. In the meanwhile, let me put up a family reconstitution or two. Hope you can read these and they don’t give you eyestrain. First an Earl Grey orphan, Violet Primrose Lackie, who went to Brisbane. 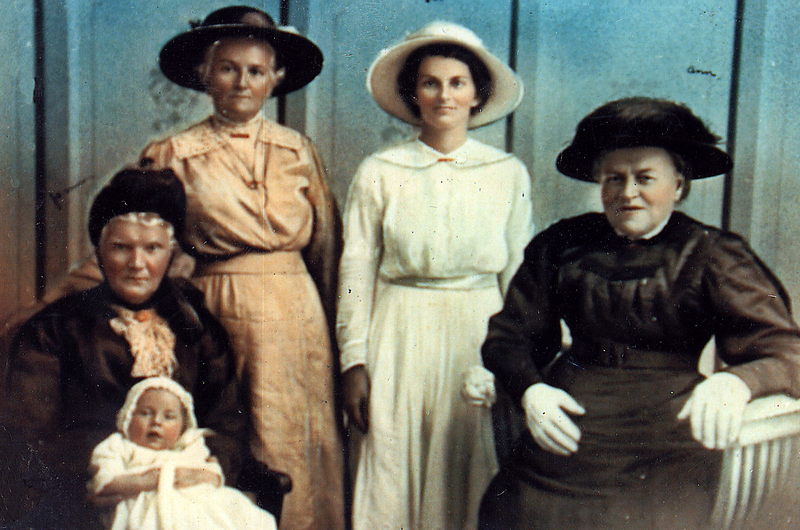 Those who went to present-day Queensland tended to live longer than the others. Gosh, you should see the mess on the page I’m working on but it seems to work okay on the post you will see. Now for another family reconstitution, that of Sarah McMullen and her husband, Daniel Burdett. I wonder if it is possible to work back from the present using this sort of thing. I imagine it would be a massive project, unless of course one used only a direct line of descent. But that would defeat the purpose; it would lose valuable demography. She is another Earl Grey orphan. She remained in Sydney. The Earl Grey Famine orphans tended to have large families, as long as their health was good and they survived the child-bearing years. My impression is that their families were larger than other Irish female immigrants, in the same age range, arriving in Australia in the 1850s. But that would need a lot more research before being confirmed. Here’s a few more pics giving us a ‘long’ view. Johanna Kelly from Kilkenny per Panama; five generations in Australia. Photo taken c. 1917. (As you can see I’m far from mastering WordPress). In recent times, a number of conservative politicians, and at least one illustrious journalist, have discovered an Earl Grey orphan in their family tree. Make of that what you will. Who comes to mind? The late former Senator Steve Hutchins of the Australian Labor party; Senator Barnaby Joyce of the National Party, formerly Leader of the National Party in the Federal Parliament; Mike Baird, erstwhile Leader of the Liberal Party and Premier of New South Wales. His sister Julia Baird, is an illustrious author, journalist and broadcaster who regularly does an excellent job ‘chairing’ an ABC programme, “The Drum”. I’ll invite you to put your own ‘spin’ on that. Here is a pic reputedly of Eliza Mahon of Carlow per Lady Peel, the orphan ancestor of Mike and Julia Baird. Let me finish with another kind of ‘success’ story. 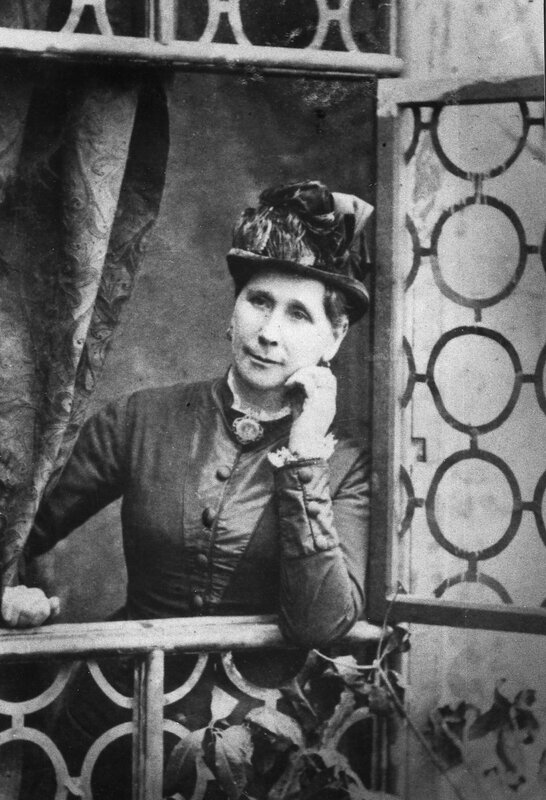 This young orphan, Letitia Connelly from Enniskillen, married William Hayes, a storekeeper and astute businessman. 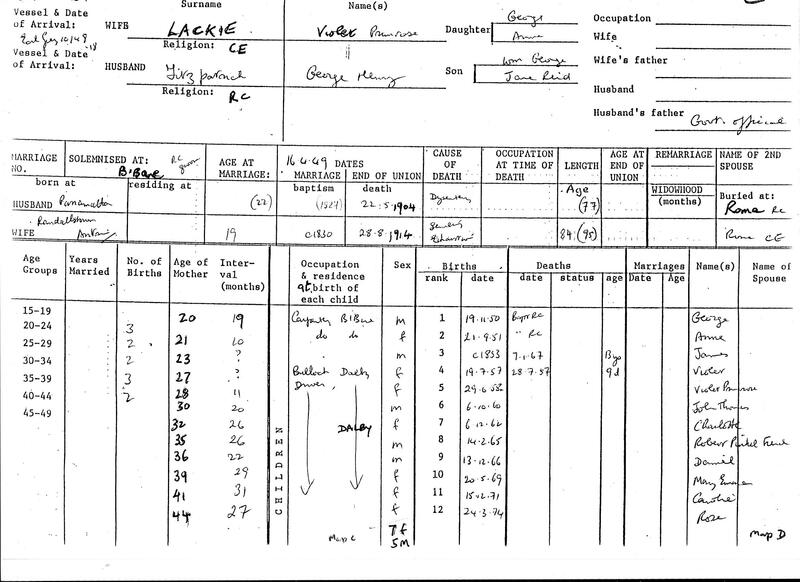 The family became wealthy on the dividends from the Goldsborough Mining Company in Victoria. His estate was valued at £7,487 in 1890. To the best of my knowledge, the family has yet to identify their descent from an Irish Famine orphan. This entry was tagged Ann Barrow, Australian Irish Famine Memorial, Barnaby Joyce, Bridget Hartigan, Demography, Derwent, Diadem, Eliza Mahon per Lady Peel, Ellen McCluskey, Enniskillen, family reconstitutions, Jane Byng/Bing, Johanna Kelly, Julia Baird, Letitia Connelly, Mary Miller, Mike Baird, orphan photographs, Pemberton, Rob Borbidge, Sarah Arbuckle, Sarah McMullen, Steve Hutchins, Violet Lackie. Bookmark the permalink. 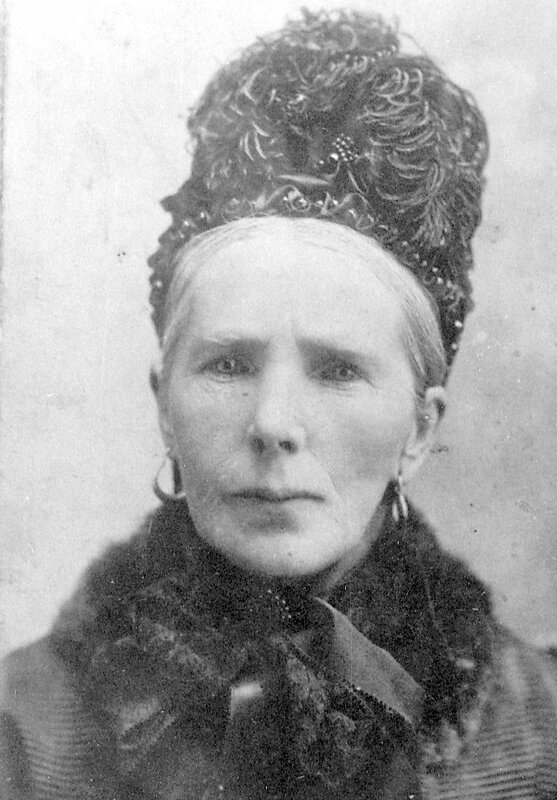 With both parents dead, Frances had been living in the Killeshandra Poorhouse, probably with Mary, her cousin whose parents had also died. So arrangements were made for the cousins to be sent to Australia and on 16 December 1848 with William Tabor as its master, the Digby a 756 tonne ship, sailed from Plymouth. On board were 22 married immigrants and 234 Irish Orphan girls. There were 8 cases of typhoid fever on board and two of the young girls died. The Digby arrived in Sydney on 4 Apr 1849 and according to NSW Assisted Immigration Shipping Lists p314 lists Frances as aged 15, was CofE, could read and write and her parents were both deceased. She was accompanied to Australia with Mary, 17, a cousin whose parents had also died. Both were listed as house servants. On arrival Frances was assigned to Major Innes in Port Macquarie as a nanny for his children. They married on 29 Nov 1852 at the St Thomas’ CofE Church in Ellenborough. James was a farmer in Ellenborough and the couple had 12 children – 2 boys and 10 girls. 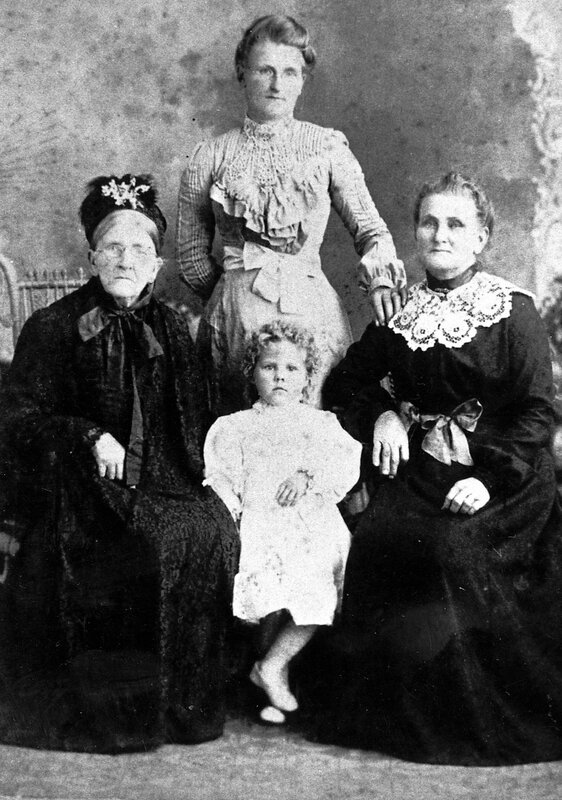 In her later years after James’ death in 1908, Frances lived with her youngest daughter May Warrell in Lorne. James’ estate was valued at £1550, mostly real estate and Frances was given 10s per week for life. Frances died on 5 Feb 1911 and was buried at Beechwood. 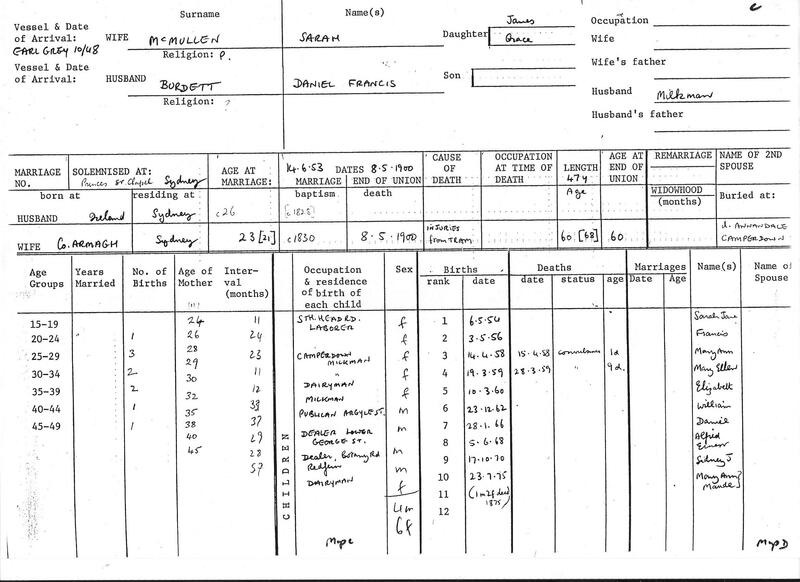 Source: State Records Authority of New South Wales: Shipping Master’s Office; Passengers Arriving 1826 – 1900; Part Colonial Secretary series covering 1845 – 1853, reels 1272 [4/5227] -1280 [4/5244]. Transcribed by Gloria Sheehan. Married 8 Aug 1849 Lewis John Willis b abt June 1829 (youngest) mother 28 when died father d 1864 d age 43-45 from Bucks at George Osbourne Mem Church Brownsville (Dapto). Moved to Shellharbour then to Bega. He died of cancer. Remarried at Bega Robert Shackles. Both buried at Bega. 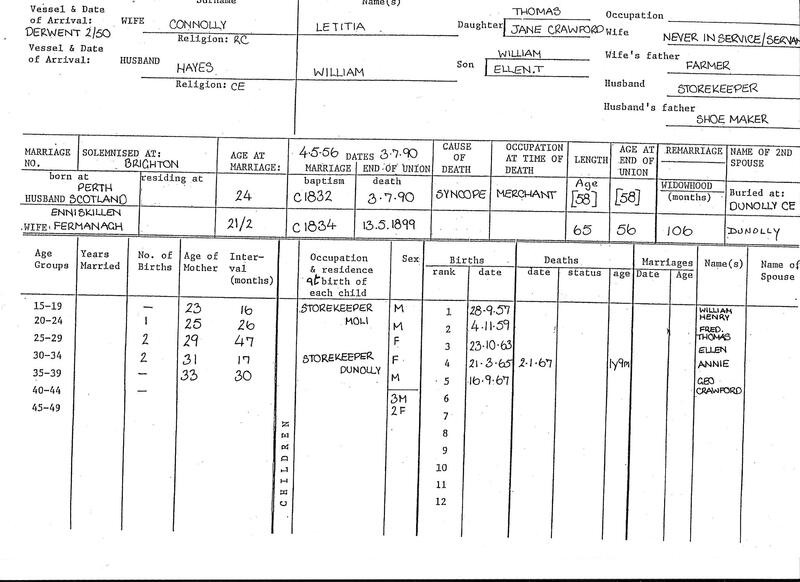 Mary Ann d Bega and husband looked after Leah. 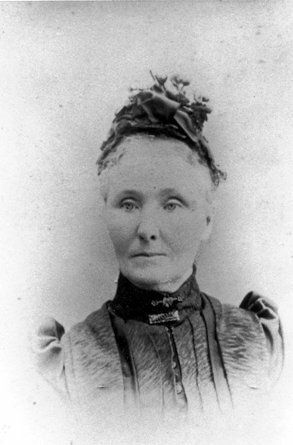 Ruth was sent to Australia on the Maria as part of the Irish Famine Orphanage program brought in to increase the population of women in the new colony. The ship left Plymouth on 7th Mar 1850 and arrived in Sydney on 29th Jun 1850. NSW Archives assisted immigrants reel 2136, 2461 Vol 2. Arrived 29 Jun 1850. Ruth was an 18-year-old Needlewoman from Dublin. She could both read and write. She married William Stephen Swadling on 13 Dec 1853 at St James CofE Church, 173 King st, Sydney. 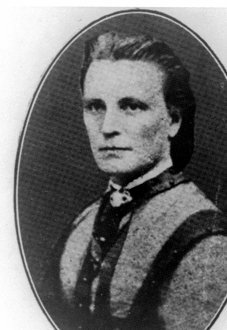 They had 7 children: Elizabeth Ruth (1854-1891); George (1856-1878); Margaret (1858-1878); Emily Eliza (1861-1942); Sarah Jane (1863-1888); Fanny Maria (1867-1869) and Annie Gertrude (1870-1876). Ruth died of TB as did 3 of her children. Four of them pre deceased her with two of them dying as infants – one (Fanny) as the result of scalds from boiling water and the other (Annie) from Scarlet fever. George (aka John) died from appendicitis. William survived all but one of his children (Emily). Their graves at Badgerys Creek have been moved but Ruth’s and Annie’s is at St Peter’s CofE Cemetery in Cooks River. Fanny’s is at Pt Frederick, Gosford. The officers and members of the above Lodge are respectfully requested to attend the Funeral of the late beloved wife of Bro Swaddling (sic); to move from his residence, College St, Camperdown at half-past 9am, to St Peter’s Cemetery. SWADLING. – In loving remembrance of my dear wife, Ruth M. C. Swadling, who departed this life on January 10, 1887, at her late residence, 64, College-street, Camperdown. To end her sufferings gave her rest. Inserted by her loving husband, William Swadling. This is really fascinating, Trevor! I so enjoy seeing the photographs as well. Thanks for building this wonderful resource. I hope you are well! Thanks Becky. Hope all is good in your neck of the woods..and not too cold. Antiques Roadshow Series-35 Episode 1 RAF Marham 1 (59 minutes episode). View at 47.55 min-51.22 min. Presentation Book: Old sample book of miniature samples of hand-sewing and other skills- tiny objects of clothing beautifully sewn with Irish linen -baby layette, bonnet, buttonhole, samplers. Handworked -Female Orphan House – Ireland -December 25 1832. The expert on Antiques Roadshow had never seen one like this before. She remarked that this would be an orphan girl’s ticket to freedom from the orphanage into employment, with a chance of working her way up in service with such skill. The girl may have been 15 to 16 years. Thanks for your work Trevor. I have shared my information with Perry so you may be able to check with him in case he has additions to it. 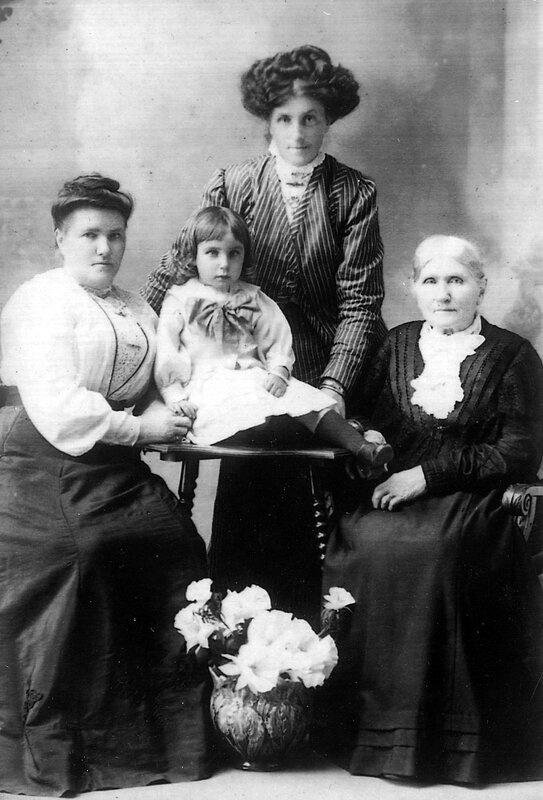 The Orphan Girls related to me are Frances (my 2x gt grandmother and her cousin) and Mary Ann Patterson from Killeshandra, Co Cavan per Digby 1849 and Ruth Harris per Maria 1850 – the wife of a 3x gt uncle. Trevor, here’s a post I did on 18 Feb 2015. Trevor, if you’d like to provide a few paras about the blog we’ll happily spread the word via Tintean, the Irish Australian online brisdgauge mag. Hope you subscribe, Trevor – free, gratis & for nothing!